He went on to say he appreciated the need for watching the bird first, he realised that the pull-away style suited his novice style, but he was still in a quandary about whether to shoot ‘gun up’ or not. 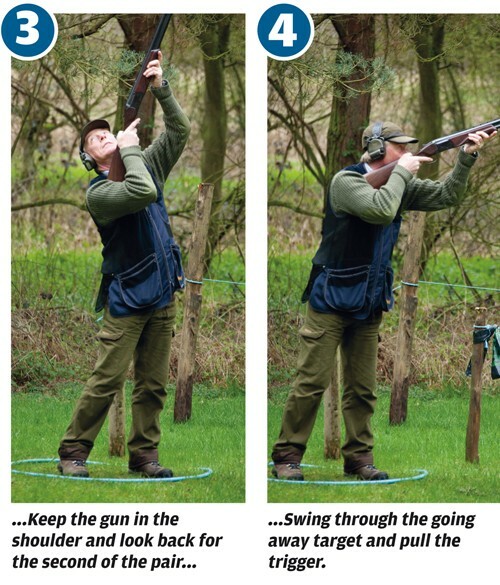 As such, maybe it’s about time we revisited the old ‘gun up’ chestnut – and see if we can dispel any myths that are still doing the rounds around the sporting layouts. First off, we have to look at why we shoot ‘gun up’ in the first place. 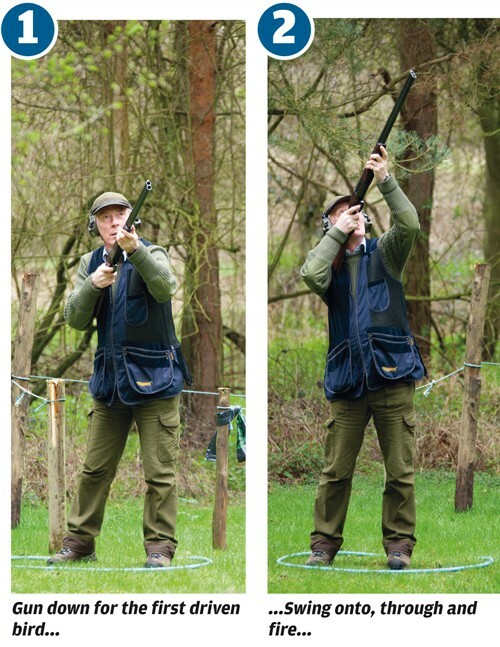 Even though learning to mount the gun correctly is always shown pretty early on in the tuition process, most beginners are initially taught to shoot with the gun already at their shoulder, ‘gun up’ style. This simplifies the training process, basically because it’s one thing less for the novice to worry about. But gradually, as the shooter’s ability and confidence increases, the gun up stance is often neglected – sometimes unwisely, in my view. Maybe it’s a personal pride thing where the shooter feels he’s going to end up as the odd one out if he shoots with the gun already in his shoulder and his face planted firmly on the stock. To me this is just plain daft. Why make things difficult for yourself if you don’t have to? The whole object is to hit more targets, so, if the rules allow, who cares if the gun’s premounted as you call for the bird? For some disciplines, the trap layouts, DTL, for instance, you wouldn’t dream of calling for the bird when the gun stock was still hovering somewhere around your chest. You simply wouldn’t have time to get on the bird and kill it. 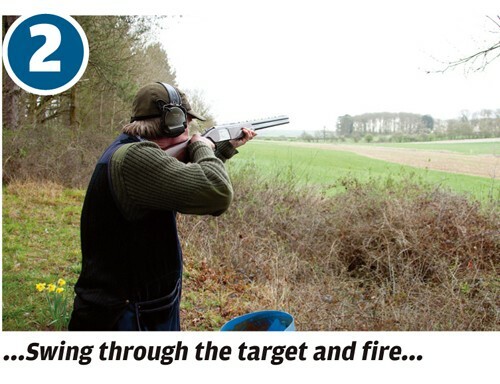 It shouldn’t be forgotten that shooting ‘gun up’ can quite often be a sensible option – especially if you want to improve your average scores – and it’s certainly not one to be scoffed at. In fact, I’m happy to shoot gun up and beat my mates every time, rather than doing the laid back, macho, thing where I’ll often end up paying for the beers! 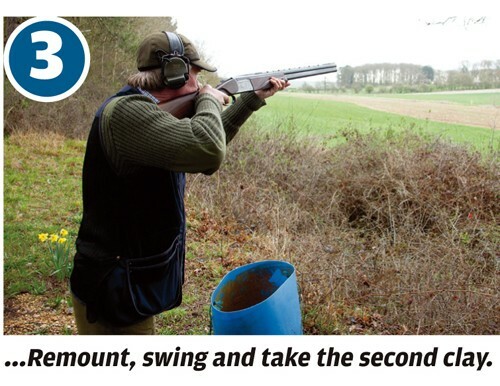 Irrespective of your ability, though, on the average Sporting layout you sometimes have to mix the mounting stances so let’s have a look at which targets can often cause problems and where your stock should be when you call for the bird. Driven birds often cause problems, and often it’s a lack of patience that’s the culprit. 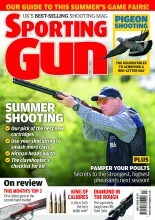 Just as in real game shooting, the driven bird is a waiting game. If you’ve got the gun already in your shoulder the instinct is to ‘aim’ at the target rather than follow through and shoot. So keep the gun down, and don’t be tempted to mount the gun too soon. If it’s a high bird, remember to wait until it’s hittable, then mount, cover the clay, swing through or ahead of the target, and fire. This very much depends on the type of target presented, so it’s really important you study the bird closely before you call for the clay. Generally, you will have enough time to keep the gun down, enabling you to mount, then follow/swing through (depending on which technique you prefer) and shoot. But, and this is where it’s crucial to see how the bird is presented, I have known layouts where the bird comes out of the trap like a rocket. If it’s really quick, mount the gun before you call for the bird and try to break the target when it’s still under power going up and away from you. Definitely a gun-down shot as more often than not you’ve got all the time in the world. For your ready stance remember to keep the muzzles pointing towards the known pick up point – usually just as the bird appears in view above or from behind trees or hedges. 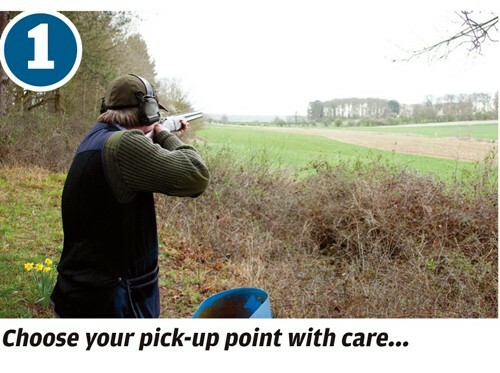 Try to kill the target when it’s at its apex – not when it’s dropping and likely to be affected by the wind. Generally speaking the ‘bolting bunny’ lends itself to using the gun up technique. This is often because the window of opportunity to shoot is limited – quite often the target has to be shot in a specific area between two natural obstacles – and quickly too! Remember to keep the muzzles of the barrels just below the line of the target’s travel and always aim to shoot its front feet off. Moving on, and upping the ante in terms of difficulty, let’s take a look at a simultaneous pair of fast crossers, a pretty common scenario that can be tackled in a number of ways. Before you consider the first bird, though, look at how you’ll take the second. Are you going to drop the gun from your shoulder after the first shot only to raise it again for the second, for instance? The swing and rhythm are obviously going to be affected. This is a classic example of when keeping the gun firmly into the shoulder between shots will pay dividends. An alternative view of this stand could be when you’re presented with a pair of birds and the second is released on report. 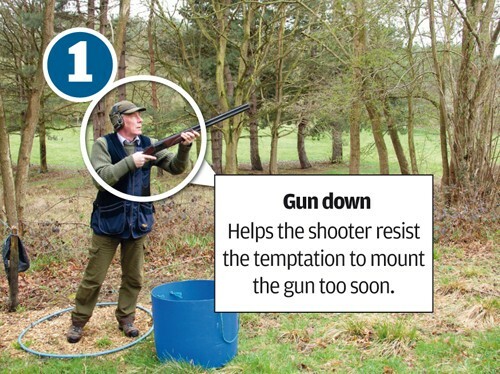 If the first needs to be taken quite quickly, this could be a good case for starting ‘gun up;’ if the second is a slow incomer, say, that’s going to take several seconds before it arrives at a hittable distance, you’re probably better off lowering the gun from your shoulder and then re-mounting. 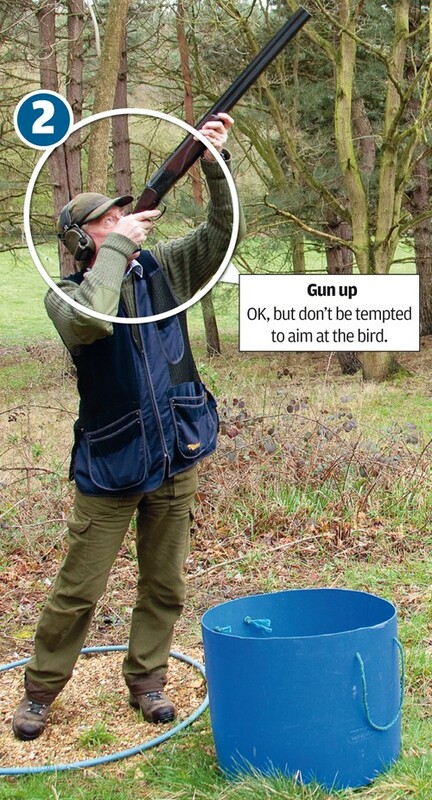 Here, holding the gun mounted while waiting for the bird can tend to make you aim at, not ahead of the target. (You’ll also find your arms getting tired, even with the lightest of shotguns). And while we’re on the subject of pairs, lets have a look at how we’d tackle one of the more difficult combinations you’re likely to see in English Sporting – a high incomer followed, on report, by a high overhead bird that’s coming from behind. As with our previous example, the thing to decide is whether it’s beneficial to have the gun up or down from the outset, and then whether to take the gun out of the shoulder for the second bird. I’d recommend you treat the incomer as you would any driven bird – keep the gun down until the bird is in range (hittable), cover the clay, swing through and fire. With the remnants of this bird dusting the hedgerows, from this point you have an option, deciding on what feels best for you. What I suggest is to keep the gun up and tilt your head back to look for the second bird. Then bring the muzzles back to be on the flight line of the second clay, remembering to keep them ahead of the target, wait until the bird reaches your chosen kill point and fire. Alternatively, you can try and turn things to your advantage. If the bird isn’t coming directly overhead and you’re not confident about shooting birds such as these, drop the gun and move your feet through 90° so you can take the second bird as a crosser. Then mount the gun, swing, and pull the trigger. 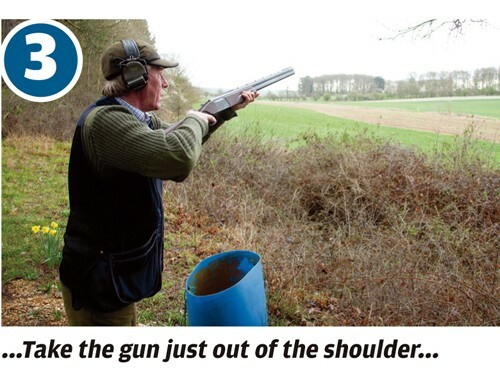 Trying to keep the gun up while you move your stance is not really recommended – the position of the gun in your shoulder is bound to move as you do.